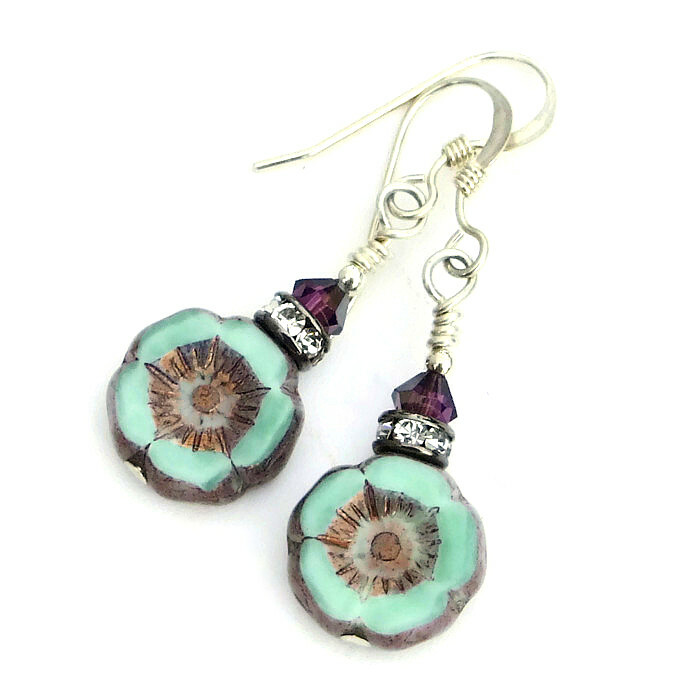 Smaller in overall size, but absolutely BIG in fashion sense, the FLOWER SHOW handmade earrings will quickly become a favorite “go to” pair of earrings. 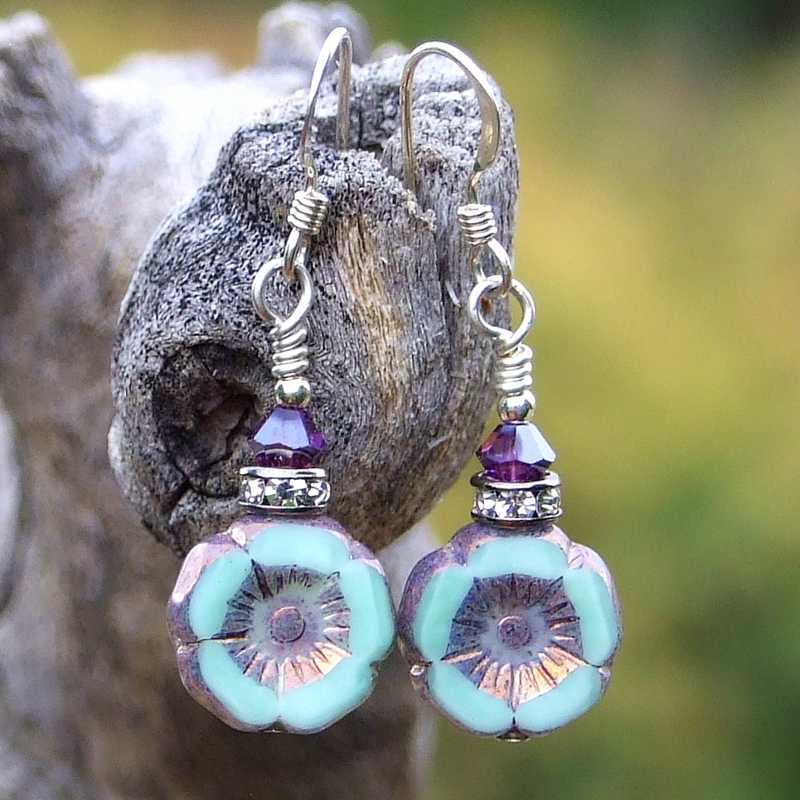 These two sided beauties feature minty green Czech glass pansy flowers with a coppery lilac Picasso finish. To add eye catching sparkle, Czech crystal and silver rondelles and amethyst purple Swarovski crystals were stacked above the flowers. Jewelry for the woman who loves unique, artisan designs, the one of a kind FLOWER SHOW earrings were carefully designed and handmade by Catherine of Shadow Dog Designs. 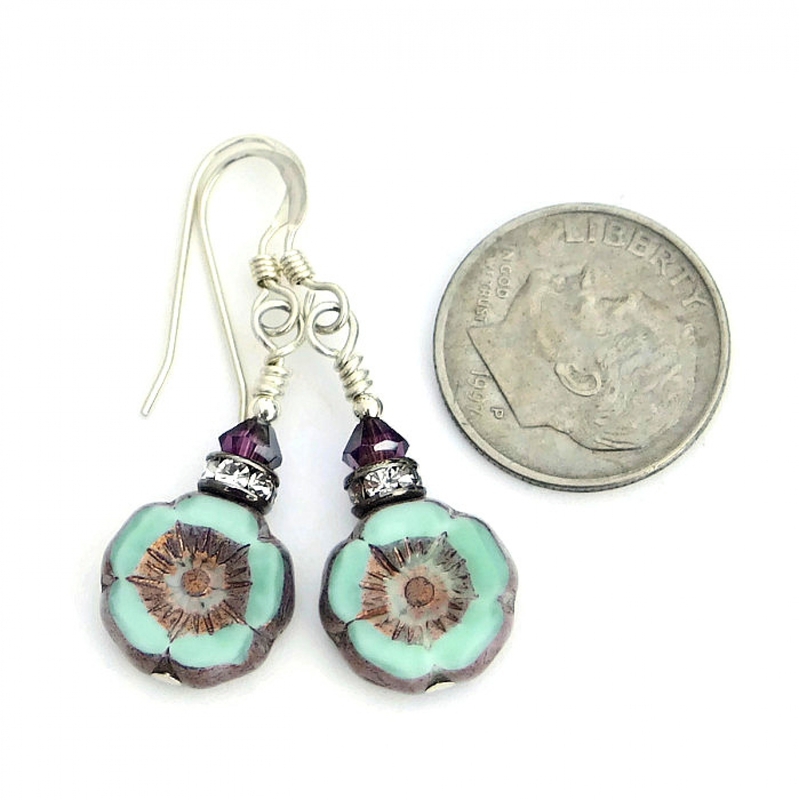 *** For a better understanding of the relative size of the FLOWER SHOW handmade flower earrings, please be sure to check out photo # 6 for a size comparison with a dime. 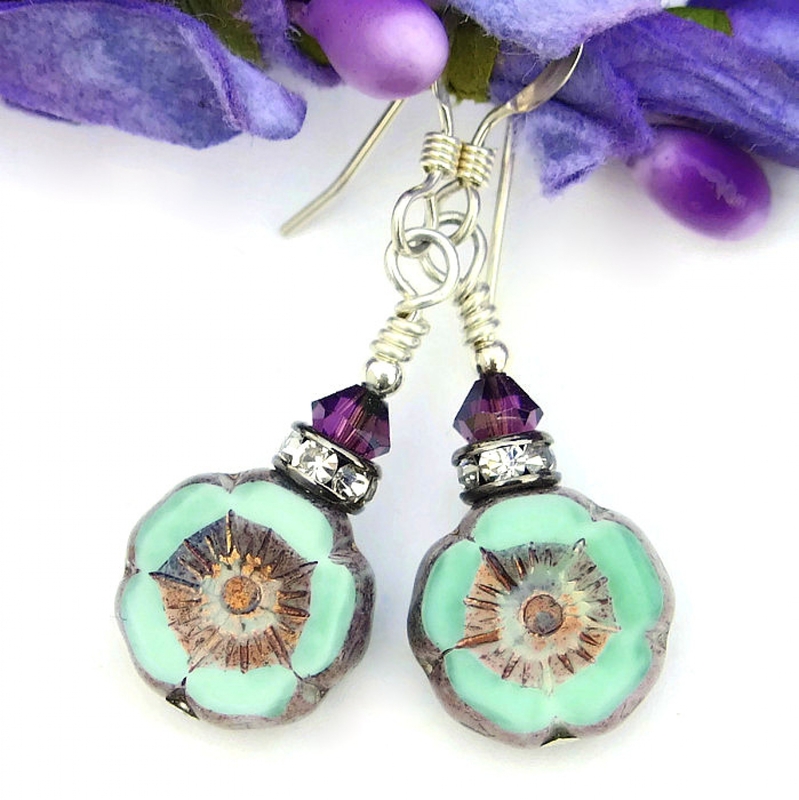 The handmade FLOWER SHOW earrings were created with premium mint green Czech glass pansy beads with a recessed ray design area in the middle of the flowers. To add gorgeous complementary color and to highlight the incredible detail, the flowers were coated with a metallic Picasso finish, a rich coppery color with a good dose of lilac. The beads were then polished, exposing the minty green color on the face of the beads but leaving the Picasso finish in the recessed areas and on the edges. 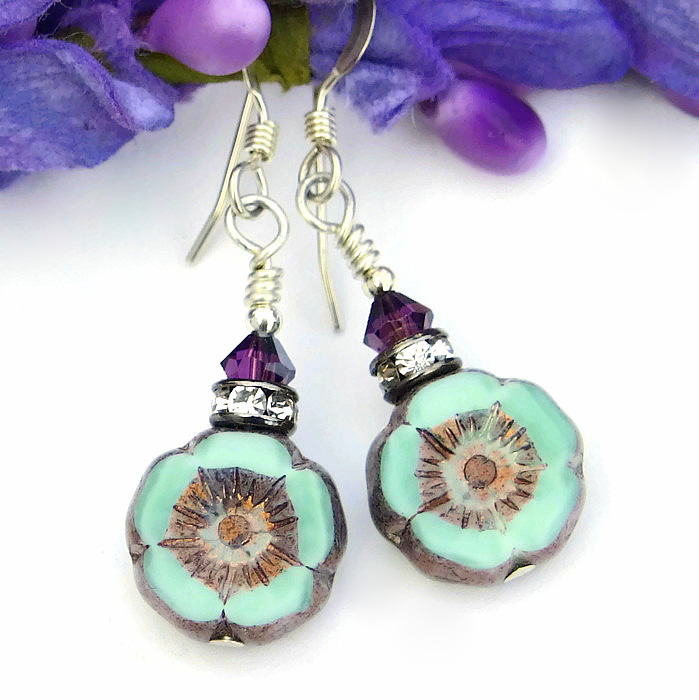 Since the flowers are two sided, the earrings look absolutely beautiful from any angle. 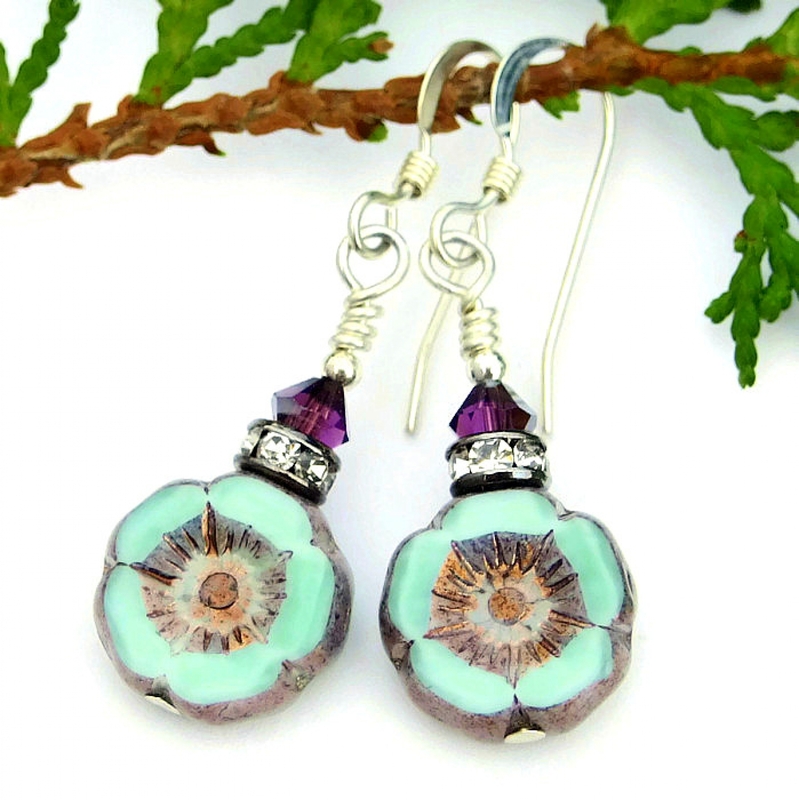 To add more than a hearty dose of great flash to these FLOWER SHOW earrings, two types of crystals were stacked on top of the pansy beads. Silver rondelles with sparkling clear Czech crystals were placed first. The rondelles have six clear crystals set into the silver bands, creating an amazing amount of light play. Then, snuggling into each rondelle is a gorgeous faceted Swarovski crystal bicone in a royal “amethyst” purple color, highlighting the coppery lilac Picasso finish. A small sterling bead was placed on top of each Swarovski crystal. All of the elements used to create the lovely earrings were placed on sterling silver headpins and carefully wire wrapped. 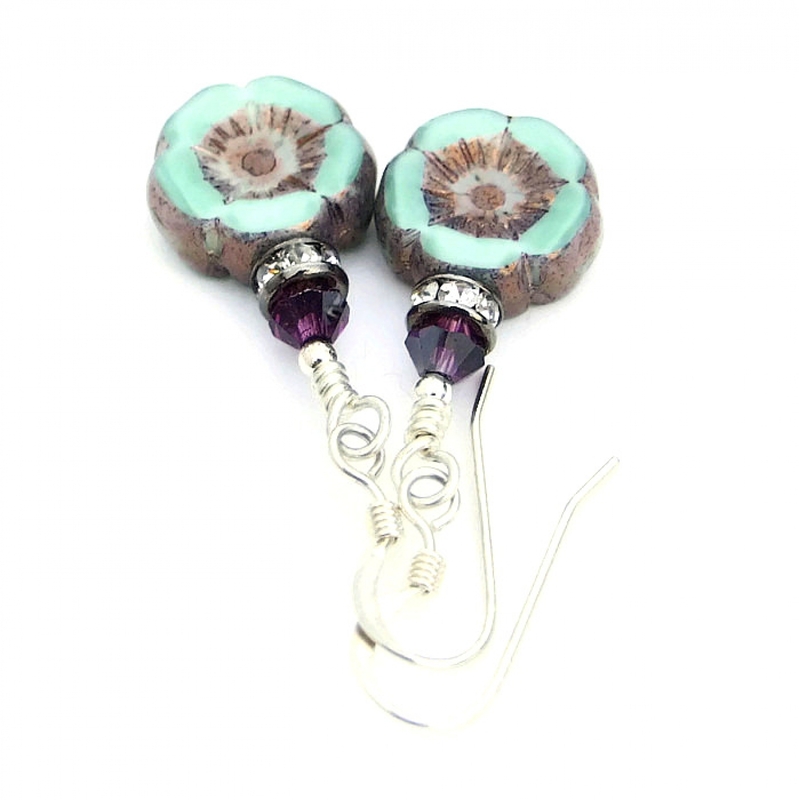 Sterling silver French hook earwires finish the FLOWER SHOW earrings perfectly. Through the centuries, flowers have been a symbol of spiritual awakening; also they have been symbols of generosity and love when given away. Even though man made, glass and crystals carry the energies of transformation, rebirth and communication. Silver is a metal of love and healing; it is a mirror to the soul, helping us to see ourselves as others see us. 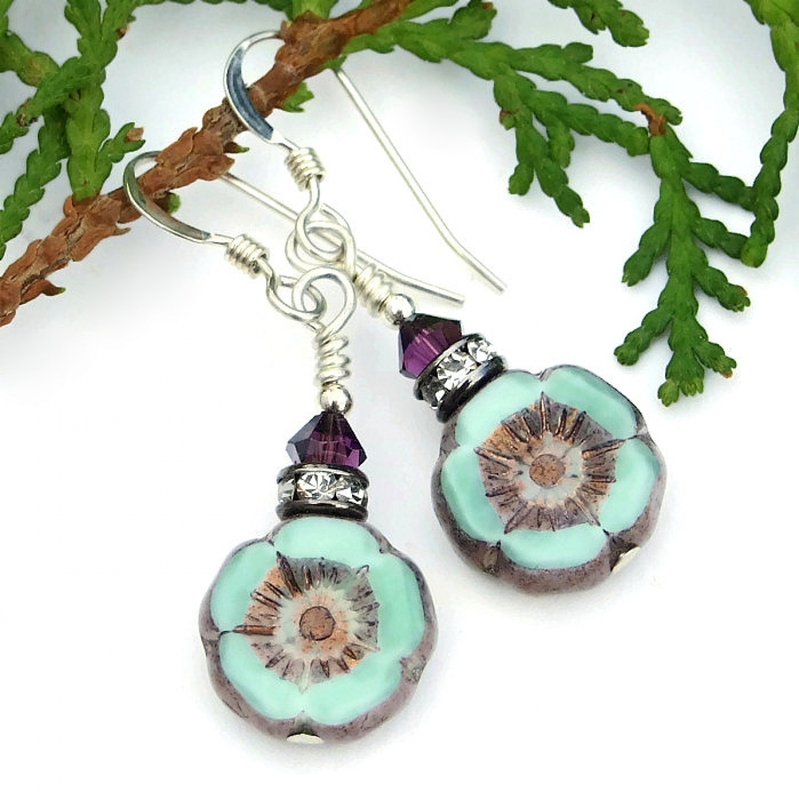 The FLOWER SHOW handmade earrings will be carefully packed in an organza jewelry bag, perfect for gift giving to a loved one . . . or to yourself!